August 21, 2013 at 10:53 am. 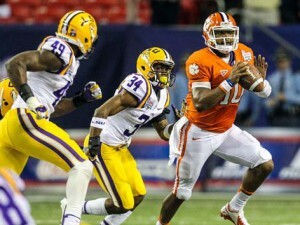 The 2013 ACC season promises to come down to Round 2 between the Tigers and Seminoles on Oct. 19 in Death Valley. The ACC, now at 14 teams with the addition of Pittsburgh and Syracuse, is better and deeper than its reputation suggests, but the league figures be a two-team race at the top in the Atlantic Division. Clemson, which finished 11-2 a year ago, opens as the conference favorite. The Seminoles, ACC champions in 2012, are their top threat. The Tigers return the best quarterback in the league in senior Tajh Boyd, who combined for 46 touchdowns last season and threw for 3,896 yards in what was the best offense in the ACC … and should be again in 2013. Receiver Sammy Watkins needs to regain his freshman form, and Clemson’s defense needs to continue to improve, but the Tigers’ offense (ninth in the NCAA in total yards, sixth in scoring) should be able to carry them to a second ACC title in three years. FSU has to replace an ACC-record 11 draft picks, the most in the country, but still has as much talent in its program as any team in the conference. The Seminoles lost quarterback EJ Manuel to the first round of the NFL Draft, but have heralded redshirt freshman Jameis Winston, a Hueytown, Ala., native who chose FSU over the Crimson Tide, ready to take over. The Noles’ defense, which ranked second nationally in total yards a year ago, has to replace seven starters, but remains loaded up front with defensive tackles Timmy Jernigan and Demonte McAllister. a 7-5 season, have the best combination of talent, and fewest problems among that group. Running back Duke Johnson brought some of the old swagger back to “The U” with an explosive freshman season in which he averaged 6.8 yards per carry and accounted for 14 total touchdowns (10 rushing, one receiving, one passing and two on kick returns). Quarterback Stephen Morris (3,345 passing yards) is poised for his best season yet. Miami, Georgia Tech and North Carolina each finished 5-3 in a three-way tie for first in the division last season. But the Tar Heels were ineligible for the postseason for NCAA violations under former coach Butch Davis, and Miami self-imposed a second straight bowl ban for findings stemming from NCAA issues with booster Nevin Shapiro. Virginia Tech, which won the division six times in its first eight years in the ACC, will also have a say in the title race after a disappointing 7-6 finish in 2012.